When I was diagnosed with Early Onset Dementia three years ago, my neurologist gave me a prescription and another appointment for three months later. That was all he could offer me, because he didn’t know that there was anything else he could do. I soon did some research on my own and learned some frightening statistics, including that I was one of the one-in-seven people with serious memory loss who lives alone, and I felt that aloneness very deeply. 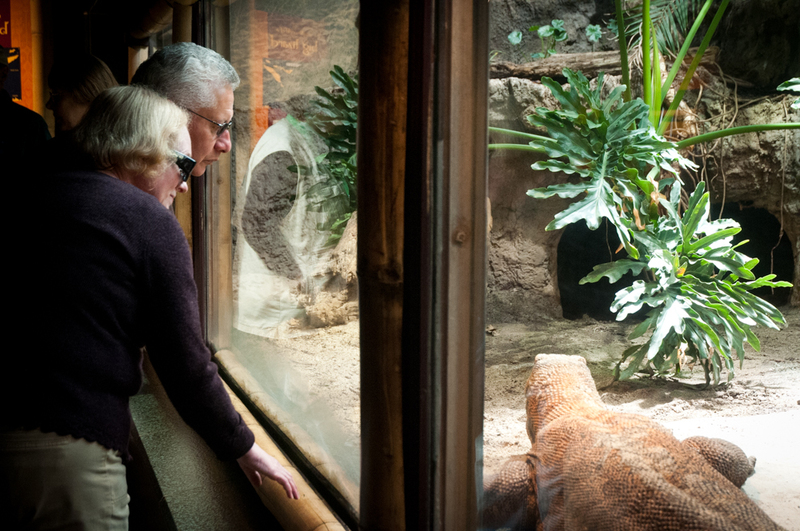 Individuals with Early Stage Memory Loss can attend Zoo Walks in Seattle and Tacoma independently or with their care partners. Fortunately, I was directed to the Alzheimer’s Association by another care provider I knew who didn’t treat dementia but knew instinctively that isolation was the wrong way to live with the condition. Roger Stocker of the Alzheimer’s Association’s Peer-to-Peer program contacted me with the good news that there were several opportunities to meet other people with dementia, including the Memory Loss Zoo Walk and the Greenwood Alzheimer’s Café. Taking advantage of these opportunities, a door opened to support, good relationships and a lot of fun. I didn’t know at the time what support would come to mean for me. I expected to meet other people with dementia and exchange sympathy and support. I found those, but more importantly found people whom I appreciated for many reasons completely unrelated to their medical condition. I started hearing the word “Momentia” in reference to these kinds of ‘dementia-friendly’ opportunities to connect, be creative, stay active, and give back to community. 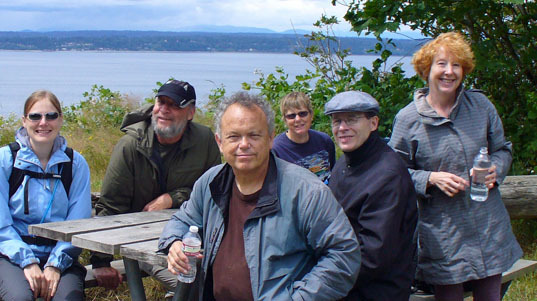 Charlie (center, front) began attending walks at Discovery Park with others diagnosed with early stage memory loss. I discovered that I’d been participating in a movement called Momentia even before I’d ever heard the word. What’s in a word? Momentia is about living with dementia in the moment. It has been called “a movement transforming what it means to live with dementia in community, changing the story from one of fear, to one of hope.” It isn’t an organization with someone in charge of it. Its leaders are people who participate in it and have ideas on how to make it even better. Momentia flourishes as new people learn of it and participate in it. Many Momentia events are organized by professionals, but people living with dementia and their caregivers are often the source for the ideas behind the events. Most Momentia events are in familiar public spaces, such as parks, cafes, theaters, art galleries and more. For example, Alzheimer’s Cafes are informal gatherings in local cafes and restaurants that provide an opportunity to connect in a laid-back, stigma-free social atmosphere. Greenwood Senior Center sponsored the second one in the nation three years ago. Now there are seven in the Puget Sound region. The Frye Museum helps here:now participants express themselves through art and social engagement programs. 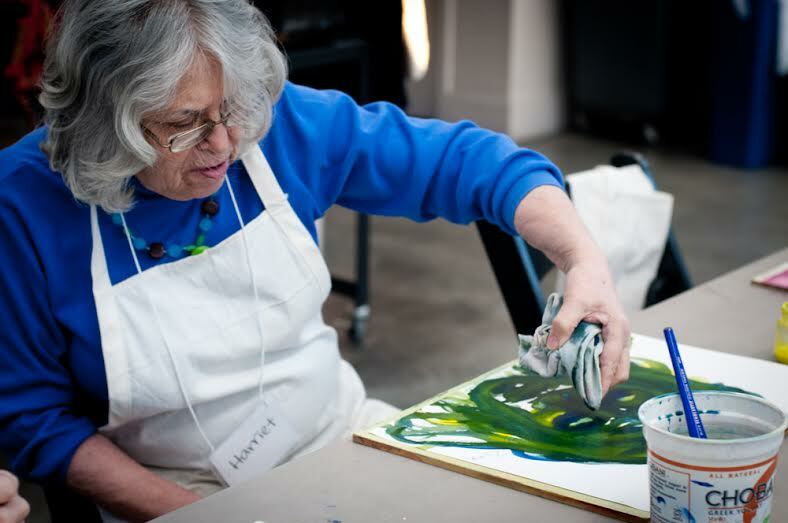 Whether it’s watercolor painting in the Arts in the Park programs, enjoying a gallery tour at the Frye Art Museum’s here: now program, or volunteering with the “Remember the Hungry” program at the Cherry St Food Bank, programs celebrate the strengths of people with dementia, and help build a dementia-friendly community. Eventually we hope that this attitude will pervade the city and that Seattle will be the most dementia-friendly city in the nation. Unfortunately I heard of other people living with dementia who didn’t have access to these great support opportunities. In many cases it was because they simply didn’t know about them or for other simple reasons such as lack of transportation. I became a part of a discussion among community members on how to get the word out about new events. As the number of activities, events and programs started to increase, and became difficult to keep track of, we decided to publish an online calendar that has grown into a website: www.momentiaseattle.org. You can be part of Momentia. It doesn’t require you to spend vast amounts of your time and energy. You can create and schedule an activity, such as an Alzheimer’s Cafe. Even just attending an Alzheimer’s Cafe builds Momentia, because it will show people that there’s a place where they can be themselves and enjoy life without fear of stigma. You can have a talk with your medical providers and make them aware of the importance of connecting with others and being active, and that there’s a community that their patients with memory loss can be a part of that will make them feel accepted and even loved. Some people who are diagnosed don’t even know that there’s an Alzheimer’s Association with programs to help people with Early Stage Memory Loss. Most importantly, if you know someone who is living with dementia, but is isolated by the illness, encourage them to attend a Momentia activity. ← We need your help to reach $25,000!